I want to approach the Second Amendment as something that’s just landed on my desk for a final review. We can discuss the back story later of how this Amendment came to be, but right now I’m only interested in reading this single sentence — the Second Amendment to the United States Constitution — as copy to see if it’s ready to go. This is not ready to go. The first thing that jumps out at me is the missing hyphen for the compound adjective — like so: “well-regulated Militia.” Also, most people today would lower case “Militia” and “Arms.” But that’s a stylistic choice that’s neither here nor there. “Being necessary to the security of a free state”? The modern convention is “being necessary for.” There are many little things like this sprinkled throughout various writings by the Founding Fathers, where archaic words or phrases crop up that often sound awkward or stiff to the modern ear. Benjamin Franklin has a remark that begins “History affords us many instances of the ruin of states…” Affords us? No one today says “affords us.” “History gives us many instances” is what people would write. A well regulated Mmilitia, being necessary to the security of a free State, the right of the people to keep and bear Arms, shall not be infringed. That Tuesday, which happens to be my birthday, is the only day when I am available to meet. The fact that Tuesday is the person’s birthday is superfluous to the meaning of the sentence: Tuesday is the only day when the person is available to meet, so “which happens to be my birthday” is understood to be nonessential. A well regulated Militia, the right of the people to keep and bear Arms, shall not be infringed. That makes more sense. It becomes even clearer if we were to rearrange a couple of things and add a few words: A well-regulated militia shall not be infringed because it is necessary for the security of a free State. 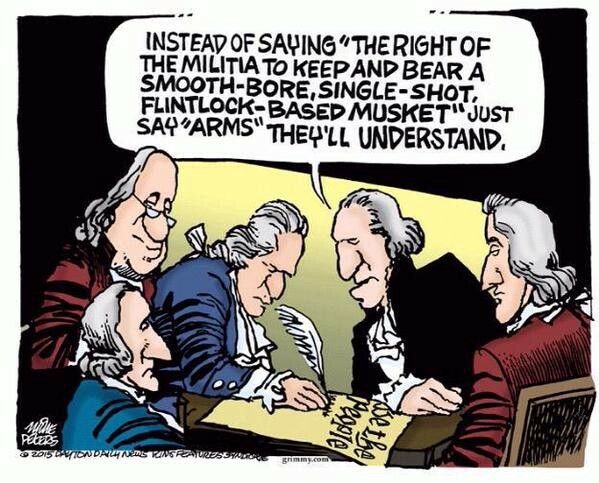 In other words, for a militia to function well it must be well regulated, and the measures taken to maintain that regulation must not be interfered with (infringed upon). A well-regulated militia, being necessary to the security of a free State, the right of the people to keep and bear arms, while serving in the militia, shall not be infringed. Seeing that a well-regulated militia is necessary for the security of a free State, the right of the people to keep and bear arms, while serving in the militia, shall not be infringed. A well-regulated militia is necessary for the security of a free State, and so the right of the people to keep and bear arms, while serving in the militia, shall not be infringed. A well-regulated militia is necessary for the security of a free State, and so the right of the people to keep and bear arms — while serving in the militia — shall not be infringed. Most modern defenders of the Second Amendment will object to this edit by saying, “If the Founding Fathers didn’t stick in ‘while serving in the militia’ it means that serving in a militia wasn’t the point of the Amendment.” I’m not buying it, for two reasons: a) a well-regulated militia is the subject of the sentence, which means that what follows will dovetail back to the subject: militias; and b) I always return to the sensible presumption that if the Founding Fathers were speaking only about the general populace’s right to bear arms they never would have mentioned militias at all. To put this another way, if the Amendment is about personal protection, why mention militias at all? Further to this, as Michael Waldman, author of The Second Amendment: A History, points out, historians know that a discussion of militias was central to the debate because James Madison’s notes on the Constitutional Convention never mention a single reference to an individual’s right to own a firearm. So why didn’t something along the lines of “while serving in a militia” make it into the Amendment? See James Madison’s explanation in this fictional exchange with Thomas Jefferson. A prefatory clause? Why would a prefatory clause be needed when you can get straight to the point with the right of the people to keep and bear arms shall not be infringed? What the Second Amendment says is that in a time when a young government didn’t have a standing army or anything that could be construed as national armed forces, the Amendment was written to let people know that no restrictions would be placed upon civilians who were serving in a military force. There’s simply no getting away from the heart of the matter. As convoluted — poorly written? — as the Amendment may seem (I’m hardly the first person to discuss the odd comma placements) — the thrust and intent of the Amendment remains obvious: a standing army didn’t exist; therefore, armed and trained (well-regulated) civilians would step up to do the job. But guess what? The United States of America now has a standing army. Doesn’t this make the Second Amendment null and void? It sure seems so. In light of yet another mass murder — the slaughter in Parkland, Florida, is, as of this writing, the seventeenth mass shooting in a school this calendar year— what is to be done? History shows that the government can create laws and then change course. The Amendment that gave us Prohibition later resulted in an Amendment that repealed Prohibition. Can the Second Amendment be repealed? Should it be repealed? Some people say that it should. No doubt hunters will be up in arms, pun intended, over any such talk. So what do we do? Well, let’s ask these gun owners a question: should any adult be able to own a shoulder-launched missile? No? You think a line should be drawn somewhere, that maybe the civilian population shouldn’t have access to Uzis and hand grenades? No, I’m not engaging in hyperbole. I’m simply noting a fact: weapons can range from a crude slingshot to a bow and arrow to a submachine gun, and along that continuum society draws a line: You can own this kind of weapon but not that kind of weapon. Maybe it’s time to reconsider where that line should be drawn. True, there’s no question that hunting will always be with us, which means rifles aren’t going anywhere. Fine. How about semi-automatic rifles that are designed to kill on a mass scale? I say all civilians should be prohibited from buying them. Going down the line to smaller weapons — and here’s where many readers will hotly disagree with me — I would be happy to live in a world where only three classes of people had access to handguns: the military, the police, and security guards. Sounds good to me. Let’s remove handguns and automatic rifles from the general population. If that idea is too radical, maybe we could institute a two-guns-per-person policy. Better yet, if we were to have a nationwide buyback on par with what Australia did in 1996, I believe that a greater measure of peace and tranquillity will be restored for the general advantage of the public. Barry Lyons is a freelance writer living in New York City. Here, have another essay on an entirely different subject. Pet peeves: religion, the war on drugs, and ‘less’ (when you mean ‘fewer’). Pet loves: Beethoven, Chopin, The Beatles, Philip Roth, and Ian McEwan.